Last Sunday (October 4) in West Hollywood Park. 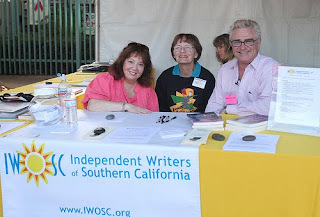 Here's some of the gang doing the meet-and-greet with aspiring and working writers at the IWOSC booth. (L to R) Linda Lichtman, showrunner Lyn Corum, Sally Hawkridge, and The Boychik.